Workbooks of the future … TODAY! With Neolithix Space Board apps, now you can use your Apple iPad as an exciting, fun and effective new tool for children to learn and master the basics of the alphabet, numerals, geometric shapes, words, directions and dozens of other essential early-academic and life-skills. 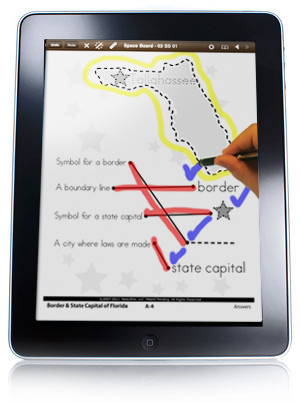 Our iPad Apps make writing by hand fun and easy… and writing by hand (digitally) makes kids Smarter! We have over 100 digital workbooks, developed by classroom teachers, Pre-K to 5th Grade. Children write by hand (digitally) on the iPad, using a stylus. Pre-K and Kindergarten focus on Visual Motor Integration Skills, Tracing, Tracking, Directionality, Alpha/Numerics, Matching, Shapes, Rhyming and Word Families. 1st – 5th Grades cover Math, Science, Language Arts & Social Studies. Self-paced, self-assessed tutorials can be used over and over again, guilt-free repetition and scaffolding. Saves paper, waste and money. GREAT green / eco product!